A luxurious king bed and a gorgeous beach front view of the Emerald Coast and the swimming pool from your private balcony; what more do you need for the perfect Florida getaway? This one bedroom, one bath unit is furnished with everything you need to relax, enjoy the beach and cook if you want to. One king Tempurpedic bed, a queen size deluxe sleeper sofa, and a full size sleeper loveseat. Sleeps 4-6. 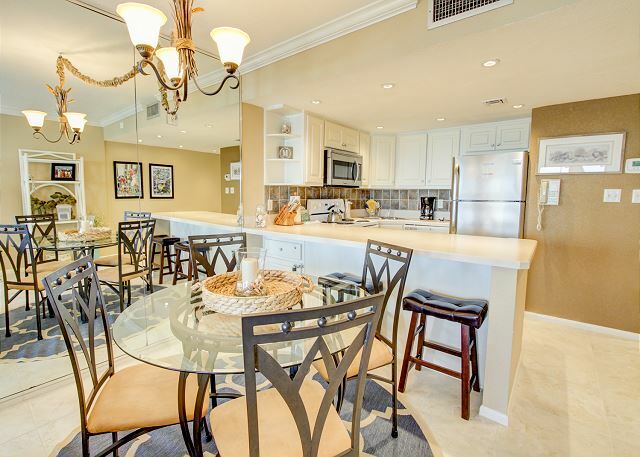 Fully furnished, recently remodeled kitchen, and great amenities (i.e. tennis courts, beach service, conference room, close to shopping, and much more listed below) make this the perfect vacation spot. Our dream has been to own a beach condo, so when God blessed us to be able to purchase this unit, we wanted to share it with others. Take advantage of complimentary Xplorie excursion to enhance your vacation. Enjoy your stay. Sorry NO PETS. You are only allowed to smoke in a designated area on the ground floor of the building. This condo was excellent! The bed was comfortable and the inside furnishings were everything we needed. Very conveniently located near many great restaurants, our favorites, The Back Porch, McGuires, & Crab Trap. 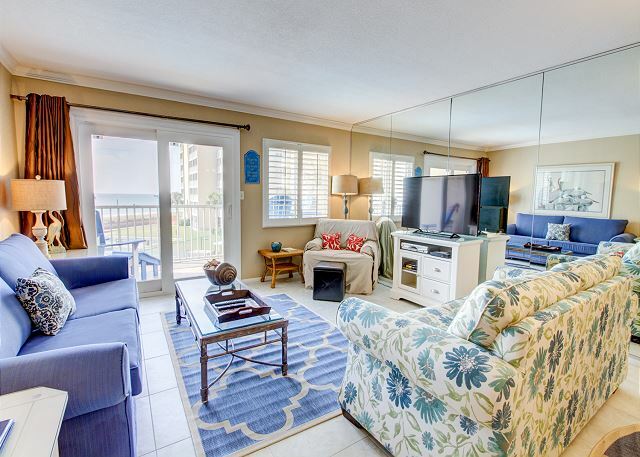 The best part about the location: the 130 steps from the backdoor of the property to the beach chair on the gulf! This was our third year in this unit our 4th at the facility. As always, everyone was courteous, other guests friendly, pool and workout room well kept. The weather did not cooperate but when the fog and rain stopped we were able to play pickle ball. 5 stars! My family has stayed at Holiday Surf and Racquet Club many times and have always had a wonderful experience. This past visit was the first time it was just two of us so we stayed in a one bedroom. It was so nice and cozy and I loved sitting on balcony and having morning coffee. Think this was my favorite condo yet! The condo 316 was older but clean and somewhat updated. There was a one inch gap behind the toilet only viewable from the shower. I did mention it to staff. Hopefully water from the shower wasn’t draining down the hole into the condo below. We only used the kitchen for quick breakfasts and lunches, but it appeared to be well stocked. Our balcony view was over the pool, a little further from the beach than I usually like. When I made the reservation I wasn’t sure where this condo was in the building and I didn’t know how the units were numbered. FYI, if you want to be close to the water, you need to choose either very low or very high numbers, like 301/302, or 323/324. Those condos are the ones closet to the beach. Also I really prefer renting a condo with a washer and dryer, and these do not have them. So you’ll have to decide how important that is to you. Great week in the sun and sand! We have been going to Destin, FL for our vacations on and off for 20 years. We have always had a great time wherever we stay. I'd have to say Holiday Surf and Racquet Club was at the top of our list. Folks at the front desk were very friendly and helpful with any questions we had. The staff employees (Scott) at the beach who set up the chairs, umbrellas and assisted with the kayaks were great as well. The unit we stayed in was very clean with and a perfect view of the ocean. Pool was always keep very clean too. Thanks for a great trip! Room and grounds were nice, no complaints. Very happy with location--it was nice to be a little further away from all the tourist craziness along Hwy 98, yet we were close enough to everything we could ever need. Had anything and everything we could need inside condo; next time we will take advantage of on-site grills. What made this entire trip was the proximity to the beach AND being able to have two FREE reserved chairs everyday. It was nice to just walk to the beach and kick up our feet for the rest of the day. Free excursions were a nice perk if we wanted to mix things up. Even though we were visiting during a very busy week, nights and mornings were quiet. Everyone was respectful of the community spaces and the location was incredibly safe. I could go on and on. We will be back; we've even recruited our families along for the next trip! We really enjoyed our stay in 316. The condo was clean & decorated nicely. The bed was comfortable. The view from our balcony was nice. Loved having the free DVD rental for our kids & the beach service. Great place for a family to stay. We will definitely book 316 again. A very nice place to stay. Quiet and relaxing. We stayed for 5 nights. The condo was very nice. We loved the location of the condo also. We would recommend to others looking for a place to stay in Destin! We had a wonderful time! Great location and amenities...however, the units kitchen could be stocked a little better. We were there for a month and cooked almost every night. The condo was comfortable and the Suef and Racquet Club had all the amenities we wanted. Great stay during the weekend hurricane Irma impacted the rest of Florida. Very nice, well maintained condo. Quiet and great onsite beaches. Property management staff was young and not very customer oriented. They were pleasant but not very friendly or helpful - stood in front of one lady for ten minutes while she was on the phone with zero acknowledgement (verbal or non verbal) of me waiting. Prior to arrival I called the property management service about how they would handle hurricane warnings and was told the curt corporate line of if you didn't buy insurance I was out of luck - no offer to look into rescheduling or any other possibilities. Other than the management staff the stay was very pleasant. The bed in the master bedroom was soooo comfy! We didn't want to leave it! The room is located right above the pool, so that was nice as well. We had a fabulous vacation. Loved seeing the boats every morning and evening. Beautiful balcony views. Wonderful stay, start to finish! I had the pleasure of visiting this unit with my mom, my 11 year old son, and my son's friend. We couldn't have been more pleased with our stay! The unit was extremely clean, well-stocked, as well as comfortably and cozy for all of us. The view over the pool was perfect for the kids, and the table on the balcony was a wonderful place for morning coffee and dolphin watching! The entire building was clean and the staff was friendly! We loved our stay!